Release Date: It's out now go buy it! Review: Well here we on on the next step of the Terry Pratchett Blog tour and welcome, today you fine ladies and gentlemen have the fine opportunity...nay DUTY of joining the city Watch! Least that how it probably sounded to Carrot...and you don't really have to join if you don't want to, and who would! And I'm probably not making my sense and that's good! Because that's what you get with Terry nonsensical sense! Here we are eight books into the Discworld world, and the first main introduction to the Watch the somewhat something police force that waddles about shouting "It's midnight and all is well". So in many ways it's a crime novel and yet its not because nothing is every really one thing on the disc, and there's sooo much packed into each novel its so many more things than the thing which it thingy. 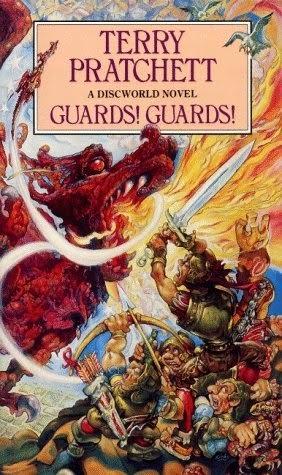 This is a great Discworld starting point in a number of ways, with the intro of the Watch and we still get a lot about the Disworld universe if you're just coming to it. I've enjoyed going back to this, I almost want to go back to all the books and re-read them, but I have to go forward and I'm excited for the journeys to come. I've had a tendency to HAVE to read the books in numeric order and I'm only on about 17 so I've lots and lots more adventures to come which I can't wait for! Make sure you're following the #TerryPratchettBlogTour over on Twitter and I'd love to hear all your Discworld memories, favourite characters, books and anything else you want to talk about! I did not know about the Terry Pratchett blog tour! I love the outpouring of affection since his passing. Though this is not the first book, like you, many people recommend this one as the place to start the series. I also notice that most folks do not mind going back an rereading these books again and again. I will always love these books!